So folks, it’s that time of year again…Thanksgiving Day is almost here!! Ahhh it’s time to watch the Macy’s Parade and pop in my copy of Miracle on 34th Street. And of course cook and…EAT! 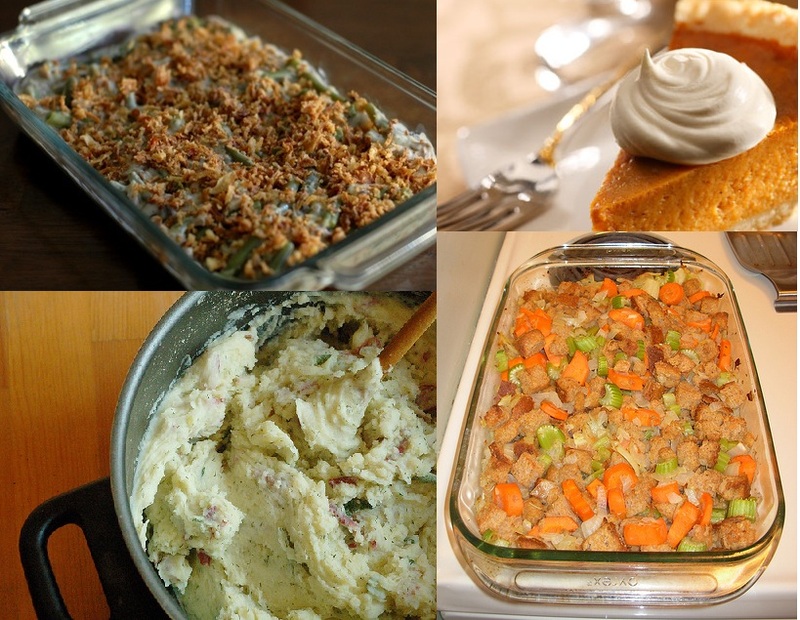 I wanted to share with you all my fave Thanksgiving recipes. Except for the pumpkin pie, which is my new recipe this year, all of these tried-and-true dishes I make each and every year. Since I’m a vegan, a lot of people ask me what I eat for Thanksgiving. I eat pretty much the same dishes a lot of other people eat, just tweaked and sans turkey of course. Anna North at Jezebel, one of my fave websites, wrote a fab article on how to host Thanksgiving for people with various dietary needs (vegan, gluten-free, kosher, eating disorder). If you’re the host, North advises to ask, listen and respect your guests…basically just practice good communication. As a vegan guest, ask if you can bring something. I’ve spent many a holiday at friends’ houses and I usually bring a dish or two. That way, I’m guaranteed something to eat and it helps out the host. While everyone has their culinary traditions, this is a great time to share your fave meals with those you love. Oh green bean casserole…bursting with tender mushrooms, crisp green beans, fried onions and creamy delciousness, how could I NOT love you?? But I know a lot of people detest green bean casserole. But I’m telling you, if you make this dish, which I adapted from Karla Marx on VegWeb.com, you’ll convert all of the non-green bean casserole believers out there. One of my dearest friend’s dads, who loathes green bean casserole, actually requests this dish…he now loves it that much! Don’t be alarmed by all of the garlic cloves (12 cloves…yikes!) in the mashed potatoes recipe. I got the idea from Donna Klein‘s The Mediterranean Vegan Kitchen. When you cook the garlic in with the potatoes, the garlic becomes milder, turning soft and creamy like butter. And you’ll never miss the meat in the gravy, which comes from Colleen Patrick-Goudreau‘s The Vegan Table. So rich and creamy with earthy mushrooms and pungent rosemary, you’ll want to slather this on everything! I love bread stuffing. I used to always eat the kind from Pepperidge Farms. But then I found this recipe online from a student at Purdue. I realized how easy it was to whip up my own stuffing – moist and chock full of herbs – and it tasted way better. To finish off your vegan extravaganza, you need an amazing finale. Pumpkin pie is the quintessential dessert for Thanksgiving. People are often intimidated by homemade pie crust. But this shortbread crust, and the pie filling, both of which come from baking goddess, Colleen Patrick-Goodreau‘s The Joy of Vegan Baking, are uber easy. I don’t like to pre-bake my crusts as I find it always makes them turn too brown. Bake this in the morning so you can focus on cooking your other dishes. Just when your guests think they can’t eat another bite after gnoshing on all that delish food, they’ll make room to devour this fragrant and sumptuous pie. After cooking all day, crack open a bottle of wine, pop a can of “the real stuff” cranberry sauce (yes, I call the stuff from the can the real stuff!) and you’re ready for your own Thanksgiving extravaganza. I hope you and your family and friends have a wonderful Thanksgiving!! In large skillet, heat 2 tablespoons of olive oil on high heat. Saute frozen green beans until thawed yet firm. You can also microwave green beans if you wish to cut down on time. In a second large skillet, heat 1-2 tablespoons of olive oil on high heat. Saute onions and garlic until onions are translucent. Add mushrooms, non-dairy butter, rosemary, sage, salt and pepper. Reduce heat to medium to high and saute until mushrooms are golden brown. In a small saucepan, heat soy milk and veggie broth on medium to low heat. In a small bowl, place cornstarch. Add 1 tablespoon of cold water (make sure it’s cold!) and stir vigorously. Add 1 more tablespoon at a time until smooth and creamy. Pour into soy milk/veggie broth mixture in pan. Stir. Remove from heat. In a large baking pan (approximately 13 X 9 X 2), add green beans and then mushroom/garlic/onion mixture. Pour soy milk mixture on top. Add French fried onions. Mix well. Bake in oven for 10-15 minutes until onions begin to brown. Sprinkle dill on top and stir well. Place potatoes and garlic cloves in a large pot. Cover potatoes and garlic with water and place on stove. Bring to a boil and reduce heat to medium. Simmer until you can put fork in potatoes and they fall apart. In the meantime, in a large skillet, heat butter on high heat. Saute onions and mushrooms. Cover. Stir frequently and saute until onions turn translucent and mushrooms turn golden brown, about 15 minutes. In a separate bowl, pour veggie broth, soy sauce, rosemary and pepper. Whisk flour into liquid until there are no lumps. Add liquid mixture to onions and mushrooms. Cook on low heat, stirring constantly until thickened. When potatoes are done, take off stove and drain. Put potatoes back in pot. Add soymilk, butter, salt and pepper. Mash with potato masher. Put gravy in a gravy boat. Toast the bread very lightly. Then cut or rip the bread into small pieces and place in a large baking pan (approximately 13 X 9 X 2). In a small skillet, heat butter on medium heat. Saute onion and carrots. After about 10 minutes, add celery. Saute until onions are translucent, about another 5 minutes. Add veggies to bread in pan. In a small bowl, combine salt, dill, marjoram, parsley and rosemary. Add herbs to pan. Pour veggie broth over bread, veggies and herbs. Mix well. Lightly grease 8- or 9-inch round pie pan with canola oil. With an electric hand mixer, cream the butter and sugar until light and fluffy. Add the flour and beat until it just comes together. Spread the mixture into the pie pan. Press the mixture into the bottom and sides of the pie pan. In a food processor, blend all of the ingredients until mixture is smooth and creamy. Pour the filling into crust and smooth the top with a spatula. Bake for about 40-45 minutes or until the crust is lightly browned and the outermost inch of the filling is set. If the filling is still soft, the pie will continue to firm up as pie cools. Transfer the pie to a wire rack. Cool to room temperature and then chill until set, 1-2 hours. Serve chilled or at room temperature.